Let us first understand a little bit about Swagger. 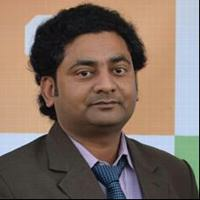 Swagger is a Document which are generated by an open source project Swashbucle.AspNetCore for Web APIs that are built in asp.net core MVC. It is a machine readable representation of a RESTful API which enables support interactive documentation, client SDK generation and discoverability. In simple words it is a simple, clean but powerful representation of RESTful APIs. Before uploading file via Swagger let us look at how to add Swagger in asp.net core Web API first. First of all, create .Net Core API project. 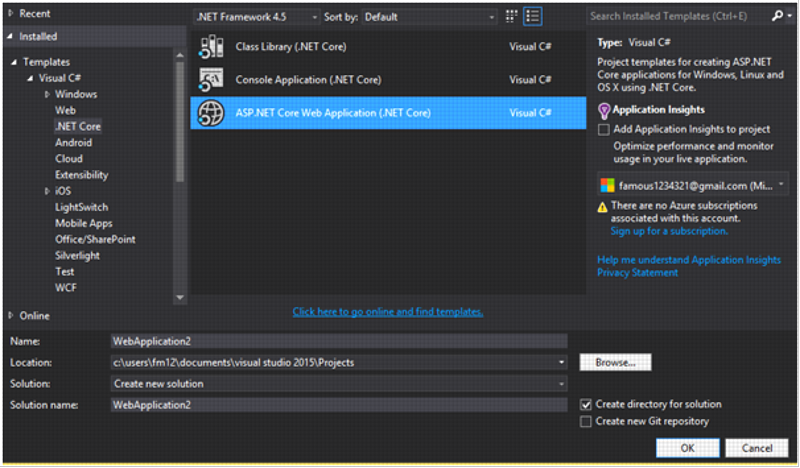 Choose .Net Core Web Application and provide a name for your project. Now Choose Web API Template from new window and keep all other in default and click on OK.The default Web API Template comes with the Controller named Values with Get, Post, Put and Delete Methods. Once the WEB API project is created, just run the app. You will see the following. There is no UI. There isn’t a list of all API methods and any other detail about them. Here is the where swagger helps us out. To Configure Swagger first of all we have to install the nugget package for it. To do that there are many ways but this one is the easiest one. Write "Swashbuckle": "6.0.0-beta901" under dependencies like this. Now open Startup.cs file to add swagger service to middleware. 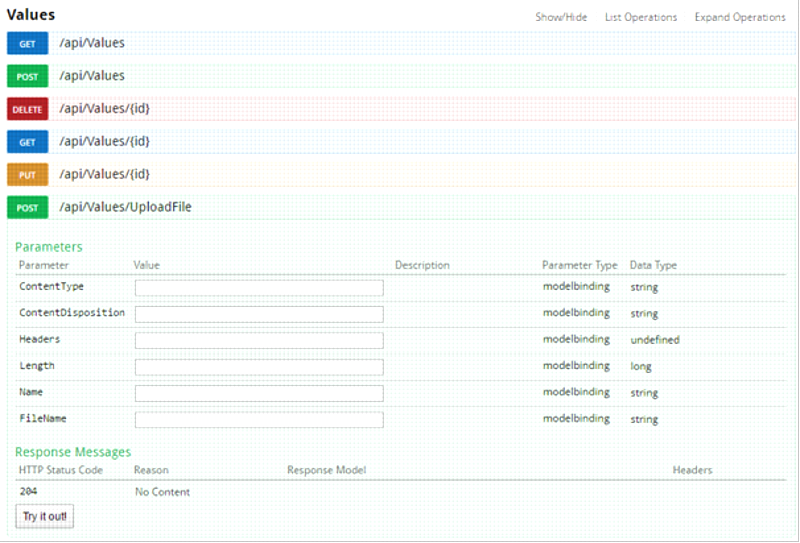 And add the codes in configure Service Method as shown in the figure. 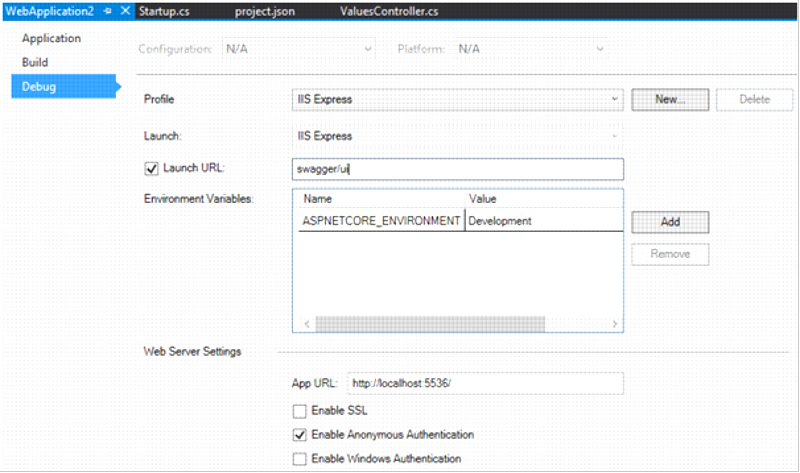 Now run the application IIS button but still now swagger UI is generated. To see the UI we have configure our URL our project. To do that we need to go to properties of our project. Right click on project name in the Solution Explorer. New window will appear. Click on Values to see the values. 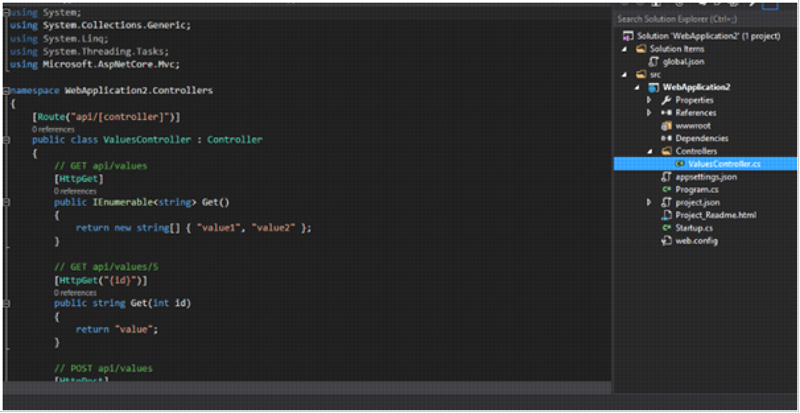 HTTP verb settings and along that API methods of Values Controller are shown in the Swagger UI. To Identify the actions easily different colours are used. Click on any of the methods given will give you details about accepted parameters and return type which allows us to test the method. 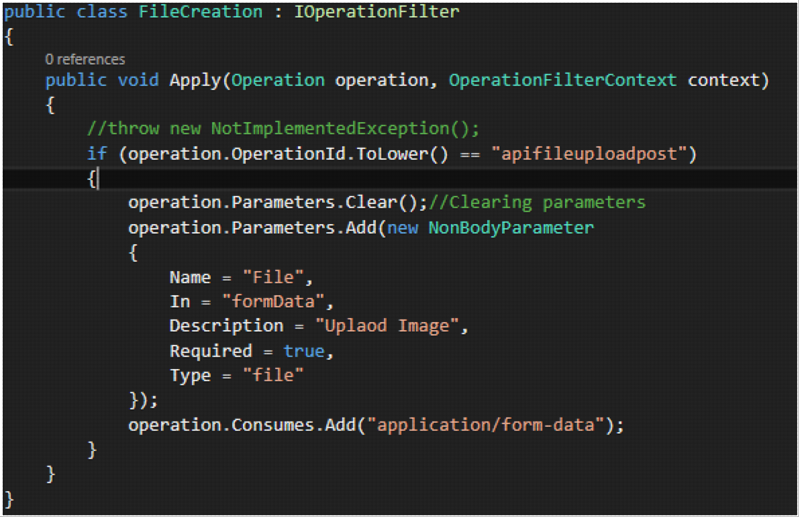 Now Let us head into uploading a file in asp.net core using Swagger. Go to the Values Controller and provide the action to upload the file as shown in figure.